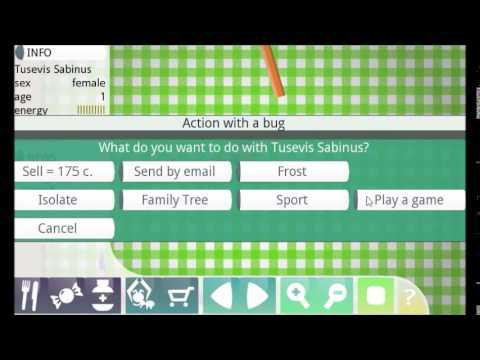 In the game Bug Breeding you will became an owner of a bug farm. The bug farm is located on the table in your kitchen. The aim of the game is to take care of the bugs. Bugs need food, sweets, medicines and equipment. All items are sold in the store for beetle coins. Coins are earned by selling bugs and by winning at exhibitions. Bugs need to feed. Energy indicator shows whether selected bug is hungry. Hungry bug will not search a partner. Hungry bug will gain low price during selling. Food is inserted by tapping with selected button with cutlery. When a bug eats, he makes a poo. Remove poo by tapping. Do not worry, it does not smell, try it. Happiness is increased by sweets, reproduction, contact with other bugs and cleaning. Sweet is inserted by tapping with selected button with sugar cube. Bugs can become ill. Fortunately, every illness can be treated using medicine. The illness shortens bugs life and ill bug does not want to reproduce. The bug can go blind. Blind bug can not find food. Dangerous disease is rabies. Bug with rabies kills every bug he meets. Medicine is inserted by tapping with selected button with a phial. Bugs want to reproduce. Desire to reproduce is connected to loneliness indicator. In case desire increases, male looks for a female and female looks for and male. Not every time, when male meets a female a new bug will born. Females lay eggs. The egg turns into worm and worm turns into a bug. You can study inheritance of body parts from parents to descendants. New species of bugs can be created in the laboratory. Created bug will bring new colors and shapes of body parts. Travel box allows to send a bug to exhibition. The exhibitions are organized over the world. Only a bug in good condition will be rewarded by big money. The water bowl allows to clean bugs. Bugs like swimming, therefore happiness grows during cleaning. If you want to ensure that a certain pair of bugs will have a child, you can close the pair to the fence. Do not forget to feed the bugs. Reproduction of beetles requires patience.